Time has passed but living long in the memory, the victory recorded in the first week of November 2006 at the Eurosib Russian Open remains crystal clear; in the colours of China, the defensive skills of Hou Yingchao combined with the ability to execute a fearsome attack when the chance arose, wove a web that entrapped his adversaries, forcing submission. On Tuesday 22nd May, Merlin the Magician was again in international action, this time in the colours of Canada; in the opening round of the Men’s Singles qualification tournament for places in the Seamaster 2018 ITTF World Tour Hang Seng Hong Kong Open, no current world ranking, he beat Chinese Taipei’s Lee Chia-Sheng, presently listed at no.467 in the world order. On that occasion, one after another, he beat Singapore’s Gao Ning and Denmark’s Michael Maze before overcoming Croatia’s Zoran Primorac in the final. Also he partnered the Dominican Republic’s Lin Ju to Men’s Doubles gold. Nevertheless, in Hong Kong he won and undoubtedly his experience counted. He emerged successful by the very narrowest of margins, the monumental fifth game being crucial to his success. (11-6, 6-11, 7-11, 6-11, 19-17, 11-6, 12-10). 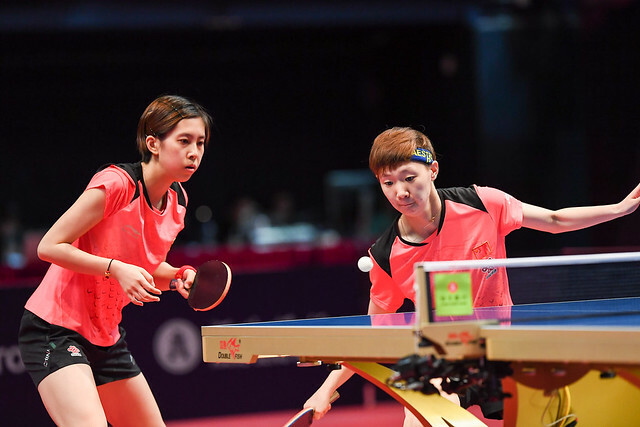 Success contrary to present day world ranking; it was the same for China’s Ma Te and Zhou Qihao, as it was for Denmark’s Zhai Yujia alongside Japan’s Masaki Takami and Yuki Hirano. Likewise, Chinese Taipei’s Peng Wang-Wei and India’s Manav Vikash Thakkar upset the pecking order. Similar to Hou Yingchao, no current world ranking; Ma Te beat Iran’s Nima Alamian (11-8, 11-3, 11-8, 11-5), Zhou Qihao, the winner of the Boys’ Singles event at the 2010 ITTF Cadet Challenge in Puerto Rico, accounted for Germany’s Qiu Dang (14-12, 4-11, 11-3, 9-11, 11-6, 6-11, 11-7). Presently Nima Alamian is listed at no.69 on the Men’s World Rankings, Qiu Dang is at no.225. Meanwhile, somewhat upstaged, Zhai Yujia, world ranked no.149 and Yuki Hirano, named at no.222, both excelled. Zhai Yujia accounted for Yuki Matsuyama, like Yuki Hirano from Japan and listed at no.149 (9-11, 11-6, 11-7, 12-10, 11-9); Yuki Hirano, the youngest brother of Sayaka Hirano, overcame colleague Kenji Matsudaira (11-1, 11-7, 11-8, 11-4). Currently Kenji Matsudaira is ranked no.139. Success for Yuki Hirano against expectations, it was the same for colleague Masaki Takami as Japan and India experienced differing fortunes. Named at no.166 on the present day world rankings, Masaki Takami beat Harmeet Desai, listed at no.76 (8-11, 13-11, 11-6, 6-11, 12-10, 5-11, 11-8). Balancing the books for India, 18 year old Manav Vikash Thakkar caused one of the biggest upsets of the day. He ended the hopes of Chinese Taipei’s Yang Heng-Wei (11-9, 11-6, 11-7, 11-7); currently on the Men’s World Rankings, Yang Heng-Wei is listed at no.203, Manav Vikash Thakkar is more than 600 places lower at no.821. Worthy performances, it was the same from Chinese Taipei’s Peng Wang-Wei, the 21 year old was not to be left out. Ranked no.193, he accounted for Belgium’s Florent Lambiet, listed at no.86 (11-8, 11-4, 11-9, 12-10). The qualification tournament concludes on Wednesday 23rd May.